-=BrewmanceNW=-: Beer Review: He'Brew Bittersweet Lenny's R.I.P.A. 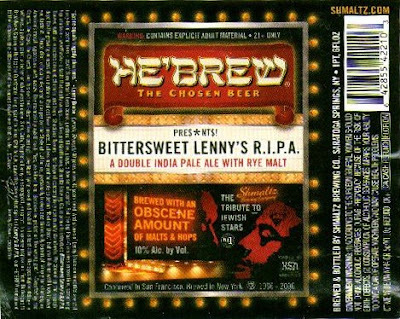 "Ladies and Gentlemen, Shmaltz Brewing Co. is proud to present Bittersweet Lenny's R.I.P.A. Brewed with an obscene amount of malts and hops. Shocking flavors - far beyond contemporary community standards. We cooked up the straight dope for the growing minyans of our nation's Radical Beer junkies. Judges may not be able to define "Radical Beer," but you'll damn well know it when you taste it. Bruce died, officially declared a pauper by the State of California, personally broken and financially bankrupt simply for challenging America's moral hypocrisies with words. The memorial playbill read: "Yes, we killed him. Because he picked on the wrong god." -Directed by, the Courts, the Cops, the Church... and his own self-destructive super ego. Like Noah lying naked and loaded in his tent after the apocalyptic deluge: a witness, a patron saint, a father of what was to come. Sick, Dirty, Prophetic Lenny: a scapegoat, a martyr, a supreme inspiration. From Burlesque to Broadway, Carnegie Hall to the Courtroom, Long Island to Lima, Ohio to L.A., savor the provocative spirit of Lenny's R.I.P.A., our HE'BREW monument to the richness, the bitterness and the sacred sweetness that is life... L'Chaim!" - Dark and filtered clear brown with a reddish hue. Fluffy and slow forming fingers of ultra light tan head settles with frothy sticky foam all over the glass and a thick pillow rests above. - Smells like a barleywine. 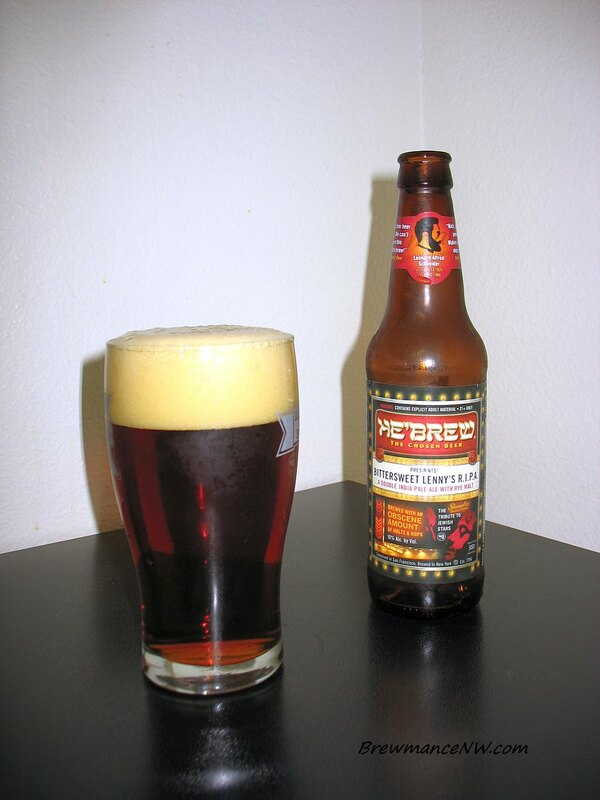 Huge thick caramel malts, bready, zesty, peppery, and sweet. Molasses, honey, grassy earthy hop. This is a sweet rich smelling barleywine for sure. - Honey and sugary caramel malt. Light cocoa, pine, zesty hop, and a subtle chocolate and desert-like flavor. Brown sugars, candy, and earthy hops. Hops are rather light. Very well balanced. - This is a rather heavy brew. Thick creamy malty body which is quite chewy, and a touch sticky. Leaves the mouth a bit dry and chalky. Certainly a nice creamy feel. - For me this beer is a bit off the mark for the style. It's certainly a barleywine. 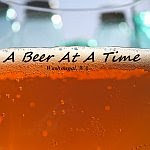 When I like a good double IPA, I don't want a barleywine. That doesn't mean that this beer isn't great.. it is. But I try to be subjective to style in my judging.. but it really always boils down to how good the beer is overall. That's why I like doing these live reviews step-by-step. I've never had a He'Brew beer that wasn't quality.